L.F Moreau - a nice old clock. Hello all. Greetings from South West Michigan. Picked up this clock at an estate auction few years ago. The clock is a bronze/brass clock. 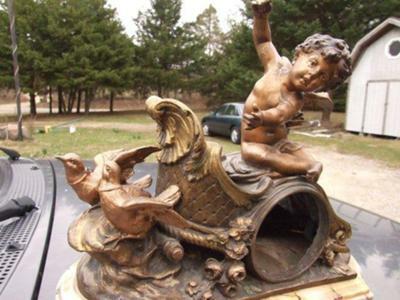 It has a marble base.The clock is in good shape and represents an angel in a chariot and two birds pulling the chariot. Initial research indicates that this clock is from the late 1800's. What might be the value of something like this?